the imaginations of toddlers. And to make sure your kid is prepared for outdoor exploration, we've designed a collection of nature exploration toys for ages 3 & up. ✔ WHISTLE: Your child can use the included safety whistle to signal when scouting, hiking, camping & hunting. It can be worn around the neck or slipping in a pocket. ✔ BINOCULARS: 30mm lens diameter, 4X magnification binoculars for kids. Adjustable, comes with nylon storage case & equipped with rubberized eye seal for safety. ✔ FLASHLIGHT: No batteries or charging cord required. The mini handheld kid's flashlight included in this nature gift set is operated by easy manual cranking motions. ✔ KID COMPASS: Teach kids orientation & NSEW directions with the child size compass. Features glow in the dark dial, magnifying viewer & adjustable marching lines. ✔ MAGNIFYING GLASS: Measuring 2 ½", the 3X magnifying glass for kids lets them get a close up view of tiny insects, soil, plants, flower petals, leaves & so much more. ✔ CARRYING BAG: Each set of exploration tools also comes with a lightweight sport backpack. Insert the exploration toys & he or she will be ready to explore the wilderness. Take the outdoors kit camping, hiking, hunting, bird watching, to sporting events & on nature walks. The nature pack for kids is a popular choice for daycares & montessori education. Inclusive of all the exploration gear growing children & toddlers need, these outdoor STEM kits make great birthday & Christmas gift ideas for boys & girls. 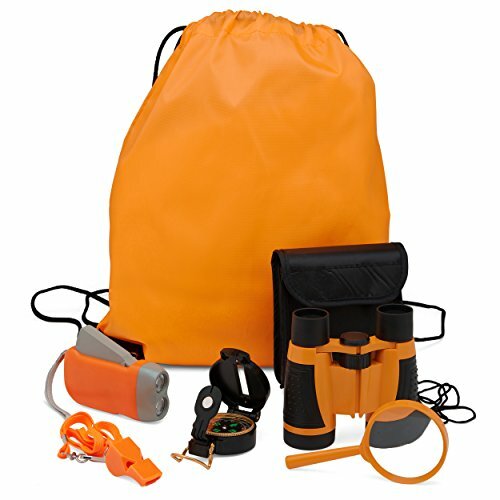 6PC EDUCATIONAL GIFT SET: Our 6-in-1 outdoor exploration kit for kids includes all the gear your child needs to explore the great outdoors when on camping adventures or backyard scavenger hunts. MAGNIFYING BINOCULARS: The ergonomic kid-friendly binoculars featured in our nature kit for kids allow growing minds to discover flying & crawling creatures that are otherwise hard to see with the naked eye. HAND-CRANK FLASHLIGHT: Also included in the all-in-one exploring kit is a mini flashlight that provides your child with the ability to glance into crevices or illuminate his or her path when outside at night. POCKET COMPASS FOR KIDS: To help kiddos learn about direction & mapping, the exploration daypack also comes with a small compass designed for kids. Use it for exploring, camping, boating, fishing, etc. MAGNIFYING GLASS TOOL: In addition to a whistle & drawstring backpack, the outdoor set for kids has been upgraded with a big magnifying glass that lets your learning kiddo examine plants, insects, gemstones, rocks & flowers. If you have any questions about this product by Trendsettings, contact us by completing and submitting the form below. If you are looking for a specif part number, please include it with your message.